The Chathams are a remote group of islands 870km off the east coast of New Zealand. The two main islands, Chatham and Pitt, were so named when a colonial expedition led by Captain Broughton, RN, landed there in 1791; the islands were named after the Prime Minister of the day. The original inhabitants were the polynesian Moriori, who named the islands Rekohu - ‘island of mists’. If anyone had told me that I would be spending New Year 2000 on the island, I would have asked … where? It’s a place few New Zealanders have visited. Thanks to a competition in The Observer, won by my partner, we arrived there in time for the ‘Millennium’ festivities. I began to wonder, what music if any, might we hear? And bearing in mind the mixed European and Polynesian origins of the residents, what would any ‘traditional music’ be like? I did not find the answer to this question to any degree; we were on the island for only 6 days. Nevertheless, there was music and song, and I found some interesting information in the hotel library and local museum. Some understanding of the historical background to life on the islands is useful to place these comments in context. I believe that many of the events of the last 200 years still affect attitudes and activities on the island. The remoteness of the islands is also an important factor in daily working and social life. During the 1830s, two Maori groups from New Zealand landed and claimed ownership of the Chathams. In the process, there was a massacre of the Moriori, followed by enslavement which only ended 30 years later under the new British / New Zealand adminstration. The original people were reduced to a few families. The last of the full blooded Morioris was a huge man called Tommy Solomon (statue, right), who lived until 1933. Today, the land is mainly owned by several Maori families, except for some tracts, farms and small areas sold to European descended families, and a Moriori area owned by the Solomon family. In the early 1800s, European and American whaling fleets found good business in the area; it being home until recently to huge shoals of small pilot whales. Some of the whalers settled on the island, perhaps having jumped ship to escape the harsh conditions at sea. Many residents today can trace their ancestry to such a whaler from the Portuguese Azores, Joe Flores, who arrived in the 1850s. Others are descended from a few English and Scottish families who set up sheep farms. In the 1840s German Moravian missionaries came to the island. Among these Europeans were a number of scholars who studied the indigenous culture. The population of Chatham and Pitt Islands has remained low, having been over 1000 at its peak, and is now around 750. Most families have mixed European, Maori and Moriori origins. Although the Internet and an airline are now regular features of business life, the atmosphere on the island is reminiscent of the west coast of Ireland. Four wheel drive vehicles are an essential to any journey away from the one main road. Sheep and fish remain the main source of income. On New Year's Eve a crowd of 200 gathered at Red Bluff cliff to say goodbye to the old millennium. To accompany the ‘ritual’ farewell, a local group of singers performed for the gathering, wearing modern bright red costumes. The choir was recently put together by the local Council, partly funded by the Government. So far as I could tell, all the performers were amateur men and women, and there were two or three fine singers amongst them - most were of Maori / European ancestry. One of the men, aged about 40, accompanied them on a guitar. I was told that most of the songs were from the Maori oral tradition. Most had simple melodies and chord accompaniment, probably familiar to anyone who has heard Maori songs before. 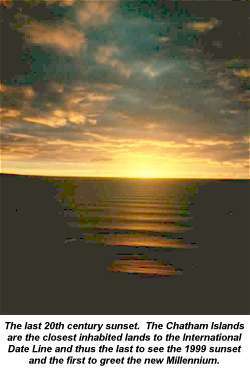 One of them was the Maori version of Now is the Hour sung, just before the last sunset of 1999. In some of the songs, a lead singer would chant the first words of the next verse to remind the other singers. The New Year alfresco community party continued at a nature reserve 500 feet up a cliff overlooking the international date line to the East. On the stroke of midnight, informal singing commenced (and drinking continued ) As well as Maori songs, I could hear various Western pop songs, including the Everly Brothers All I have to do is Dream (1956? ); and others more recent than that! These were accompanied by guitar and several layers of voice harmony. The ‘official’ songs at the early morning performance were interspersed with Maori hakas and other chants, one of them including actions with a scimitar; another included the call of a large conch shell. These were only performed by the men. An added, written section involved a song with a short ceremony with children and local stones (including a large piece of opal). The ‘message’ was about the importance of the land (from which the islands’ only wealth comes), and brotherhood and harmony between different racial groups. The songs were a mixture of those from oral tradition and more recently composed material. According to one modern account, ‘Chatham Islands Maori children were forbidden to speak their own language in school, and knowledge of traditional culture, stories and songs remained with a few elderly women’. There has been a revival of interest in Maori tradition within the last 20 years, and this was clearly reflected in the New Year performance. Maori values are important on the islands; family history is only conveyed by oral transmission. Russell Goombs, of Maori / European descent, told me that it is too sacred to be written down. The importance of land ownership means that a tract of land remains within one family upon the death of the elder member. The community choir performed a song based on a poem written some 65 years ago. The poem, titled ‘44S - 178W’ appeared in the ‘Sandhills Magazine’ associated with the school at Te One (a village near Waitangi). It extols the joys of the Chatham Islands, including the lagoon, Lake Huro, its ‘silver shores’, ‘ black swan gliding’ and says, ‘you are home to me’. The words were written by Nehu te Wiata, who settled on the Chathams in 1910 at Owenga, a fishing village. He was educated at Hawkes Bay, New Zealand. His full name was Te Ranehu Te Wiata Te Horo and he worked as a dairy farmer. According to two local authors (Fiona Holmes and Te Miria Kate Wills Johnson), he was also a piano player, who performed for dances. He was said to have played ‘most instruments’, although ‘never recorded’. He played at Te One community hall,and was associated with the school. He died in 1957 aged 77. An intriguing exhibit in the Waitangi Museum is a programme for a ‘ball’ in 1916. The order of the first seven dances is Quadrille; Waltz; Lancers; Waltz; Schottische; Albert; Military two step. Did Nehu te Wiata play piano at this dance? If he was accompanied by other instruments, what were they? That Europeans brought their own popular culture before the age of the radio and gramophone is of course, no surprise. In 1864 a Northern Irishman, Thomas Ritchie, visited the Chathams aged 20, and lived there for 60 years. He leased a farm from a Maori chief Katene, and he kept a useful diary. He was an associate and friend of a Scot, Archibald Shand, who was the islands first magistrate. Ritchie’s diary describes an ‘at home’ with the Shand family. ‘Mr Shand brought down a piano, and Mrs Shand is an expert in playing it. Of course we all learnt the polka, schottische and waltz, but the square dances we did not attempt until Captain Thomas brought his 'Enquire Within' book and sat up in a corner and read out the first set of quadrilles sentence by sentence, and I having learnt them at home put them through. It ended in our dancing the first set of lancers pretty fairly.' Captain Thomas, incidentally, was an officer in charge of Maori prisoners taken from mainland New Zealand. Somewhat earlier, Richard Copping, a whaler, described how in the 1840s his ship encountered the Maori community at Waitangi. He complained that a barque, the ‘Cuba’, had recently arrived from London and spoiled his chances of trading at the port. The reason? We visited a large homestead at Ohinemama in the south of the island,built in about 1900. An important feature upstairs is an upright piano made or sold in Berlin by Weisner and Co, dated 1885. It has survived remarkably well. In the same house is a small organ made or sold in Paris by Alexandre, of similar vintage . In the house there is a ‘wind up’ gramophone, circa 1920s; a collection of 78 rpm records from the 1930/1940s; and LPs from the 1960s. Many of them are of Gene Autry, and other ‘cowboy’ and Country and Western singers. Much of the music we heard on the airwaves, on radio,from the juke box in the Hotel Chathams, and over the tannoy system at the local 125 year old racecourse, could be described as Country Rock, or Rhythm and Blues. What of the original community, the Moriori? Today’s descendents of Tommy Solomon and the original inhabitants of the Chathams are proud of their heritage. They include the Preece family, whose members include the Anglican priest of St Augustine’s church, Te One, and the chairman of the Chatham Islands Council. Moriori descendents are held in high regard by all but the prejudiced. Several studies of Moriori culture and history were published by the Polynesian Society of New Zealand. One paper, dated 1911, was by Archibald Shand’s son Alexander, who lived in Waitangi. This is a collection of tales,and legends, with some chants and songs, written in the original language and partly translated into English. Other than the events referred to, I have little informatiom of community events,school, family or private gatherings, or any public performances. It is therefore difficult to judge the relative influences of oral traditions, both European and Polynesian, and commercial popular ones. Western popular music is clearly as dominant as elsewhere in the world and relects the long legacy of the colonial years and the effect of twentieth century technology. Nevertheless, it seems that the revival of interest in indigenous music and culture is significant, and is beginning to bear fruit . The idea that Maori and Moriori culture is at least as relevent as Western European or American is important. It probably mirrors changes in attitude across New Zealand in the last twenty years. All secondary education takes place on ‘the mainland’, and many families are split, since many seek work in New Zealand. This reduces any cultural isolation there may be on the islands. The influence of Western popular music is not something new, but the possibility of a Maori pianist playing music for the quadrille or the lancers in 1916 is not something I would have predicted! Television is relatively undeveloped, due to the distance from New Zealand. Radio is available with a suitable aerial. Records and CDs are only available for purchase on the mainland,and there is clearly not a large market on the island for recorded music. This might indicate that changing fashions in popular music may not reach this remote spot. However in an exhibition in the Waitangi Community Hall, there was a photograph of a punk dance taken about twenty years ago in the same hall! My visit to the Chatham Islands suggest that although suppressed by European rule, oral traditions, particularly those of the Maori have survived to a significant degree. 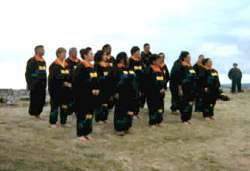 The local singing group, by reviving Maori traditions for public performance is an attempt to redress the balance. European and American influence was, of course, very noticeable, and written sources suggest this started from the moment ships arrived in the 1840s, spurred on by the desire to trade. Westerners brought musical instruments, and later gramophones. Although these influences could have eliminated Maori music, what seems to have happened instead is that their music incorporated rhythmic and melodic elements of Western popular music, at the same time introducing the guitar. This article has only skimmed the surface of this subject. Perhaps readers in New Zealand may like to spend time on the islands to confirm or correct any comments I have made! Note: this article is a revised version of one sent for publication in the Open University Music Society newsletter.